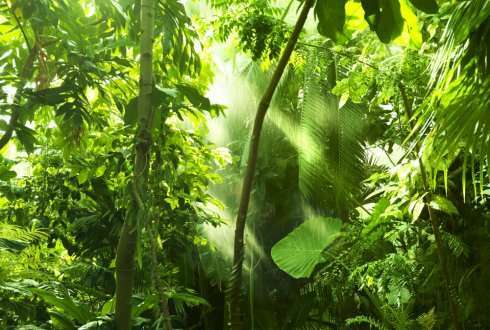 Tropical forests store 25% of the global carbon and harbour 96% of the world's tree species. But it was not clear whether this high biodiversity really matters for high carbon storage. Now, researchers of the ROBIN project have found out. This is especially important giving the United Nations climate negotiations in Paris, where countries need to agree on a mechanism to preserve the carbon locked up in forest biomass, while at the same conserving biodiversity as an additional benefit. Lead author Professor Lourens Poorter says: "There are good ecological reasons why biodiversity conservation should matter for ecosystem functioning. Ecological theories indicate that species richness can enhance carbon uptake; species have different strategies to acquire and use resources, and they are therefore more efficient together. Species respond also differently to climatic fluctuations, which means that a high biodiversity buffers the carbon uptake and storage of the ecosystem against climatic variation. These ideas have been tested for relatively simple systems such as temperate grasslands, but never for hyper-diverse tropical forests." The team pleas therefore that biodiversity conservation should be an integral component of the REDD+ mechanism (Reducing Emission from Deforestation and Degradation of the UN). Researcher Marielos Peña-Claros says: "We have brought this message last month to the EU-parliament in Brussels, where we presented the results and implications of the ROBIN project. These results are also very important for the climate negotiations in Paris; they indicate that high biodiversity is not only nice to have, but that it is also important for the carbon storage potential of tropical forests."